If you have a hankering for something sweet and juicy, look no further than a peach. This low-calorie summer fruit is rich in vitamins A and C and the antioxidant beta carotene. It’s also loaded with potassium, which is important for nerve function, muscle contraction and metabolism. Even better, it can be incorporated into a variety of recipes—everything from the sweet to the savory. Pour yourself a peach julep, which contains cognac, Rooibos tea and, of course, an overripe peach and a large bunch of mint. It only takes 5 minutes to make, and it’s quite refreshing. Check out the recipe here. Whip up some chilled peach soup with fresh goat cheese. Simply marinate fresh peaches with dried apricots, honey, vinegar and olive oil, then puree. Season with vinegar to taste. For the recipe, go here. Summer is the perfect time to grill fish, and fresh fruit salsa is a perfect accompaniment. Try serving grilled halibut with peach and pepper salsa at your next dinner party. The sweet and spicy flavor will be a hit with your guests. Here’s the recipe. Peaches and pecans are a delicious combination, so make a pecan-peach cobbler. It can feed a crowd and is tasty with whipped cream or vanilla ice cream. You can serve it warm or cold. Recipe here. Try making some peach, currant and cilantro chutney. 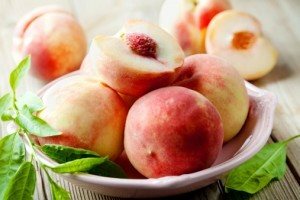 It includes a variety of ingredients–apple cider vinegar, sugar, a shallot, ginger, cumin seeds, lemongrass, curry, fennel, basil and, of course, ripe peaches. Go here for the recipe.